Dozens of ballistic missiles are missing in Iraq. Vials of dangerous microbes are unaccounted for. Sensitive sites, once under U.N. seal, stand gutted today, their arms-making gear hauled off by looters, or by arms-makers. All the world now knows that Iraq had no threatening "WMD" programs. But two years after U.S. teams began their futile hunt for weapons of mass destruction, Iraq has something else: a landscape of ruined military plants and of unanswered questions and loose ends, some potentially lethal, an Associated Press review of official reporting shows. The chief U.N. arms inspector told AP that outsiders are seeing only a "sliver" of the mess inside Iraq. Demetrius Perricos reports that satellite images indicate at least 90 sites in the old Iraqi military-industrial complex have been pillaged. The U.S. teams paint a similar picture. "There is nothing but a concrete slab at locations where once stood plants or laboratories," the Iraq Survey Group said in its final report. But that report from inside Iraq, though 986 pages thick, is at times thin on relevant hard information and silent in critically important areas. Just days after the report was issued last fall, for example, news leaked that tons of high-grade explosives had been looted a year earlier from the Iraqi complex at Qaqaa. It was a potential boon to Iraq's car bombers, but the U.S. document did not report this dangerous loss. Similarly, the main body of the U.S. report discusses Iraq's Samoud 2s, but doesn't note that many of these ballistic missiles haven't been found. Only via an annex table does the report disclose that as many as 36 Samouds may be unaccounted for in the aftermath of the U.S.-led invasion. Seventy-five of the 26-foot-long, liquid-fueled missiles were destroyed under U.N. oversight before the war, because they too often exceeded the 93-mile range allowed for Iraqi missiles under the 12-year-old U.N. inspection regime. After the U.N. inspectors were evacuated on the eve of the U.S. invasion, they lost track of the remaining missiles. The Iraq Survey Group, which ended its arms hunt in December, says a complete accounting of the Samouds "may not be possible due to various factors." Besides the Samouds, up to 34 Fatah missiles — a similar but solid-fueled weapon — are also unaccounted for. And more than 600 missile engines may be missing; the U.S. document simply doesn't report their status. Perricos, in the AP interview at his New York headquarters, expressed concern about the missiles. "If they have been destroyed, somebody should know they've been destroyed or not. Have they gone somewhere?" he asked. The worry is not that Iraqi insurgents might field the missiles, he said, but that advanced Samoud or Fatah parts might secretly boost missile-building programs elsewhere in the region or beyond. "The engines can easily be sold for a lot of money for the insurgency," he said. Asked about gaps in Iraq Survey Group reporting — specifically the silence on the Qaqaa explosives — a CIA official replied, "Our focus and goal was to find WMD, not conventional explosives." The official spoke on condition of anonymity. Led by CIA special adviser Charles A. Duelfer, the Iraq Survey Group discredited Bush administration claims of an Iraqi WMD threat by determining that Baghdad's programs to build nuclear, chemical and biological weapons were shut down in 1991 under U.N. inspection. But paperwork discrepancies and stray pieces from past programs -- from artillery shells to test tubes — have left a "residue of uncertainty," as the latest U.N. inspectors' report put it. On top of that, the disorder following the U.S.-led invasion exposed dangerous material and equipment, previously under U.N. seal, to theft. Samouds and Fatahs are only the biggest items on the "unaccounted-for" list. The smallest are bits of bacterial growth for biological weapons. The Iraqis said this bioweapons material was destroyed years ago, but not all is documented. Inspectors simply don't know whether vials of seed stock — including deadly anthrax and botulinum A bacteria — may have been used to nurture more batches that are unaccounted for. "From bits in these original vials, you can create a hundred others, and we just want to know, has all this been traced?" Perricos asked. 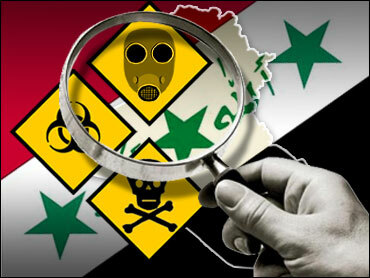 The Iraq Survey Group lists the fate of bioweapons seed stocks under "Unresolved Issues." The U.S. arms hunters' findings further cloud the picture on another item, 155mm mustard-gas shells with a dead-end paperwork trail. At least 13,000 shells filled with mustard were destroyed under U.N. supervision in the 1990s, but 550 were never found. Iraqis told U.N. inspectors they were destroyed in a fire. Now the U.S. teams say an imprisoned Iraqi official told them a Special Republican Guard unit retained the chemical rounds, and Iraq was about to declare them to U.N. inspectors when the Americans invaded. His account, otherwise unconfirmed, raises the prospect of the mustard, an incapacitating blistering agent, falling into the hands of the anti-U.S. insurgency in Iraq. Although some chemical weapons lose potency quickly, mustard remains viable for years. Perricos said stray chemical ordnance may have lain unnoticed in Iraqi ammunition dumps when the invasion began. "We don't know if they have cleaned up, if they have visited, for example, the munitions depots," he said of the Iraq Survey Group. The group's final report acknowledges, in fact, that "only a fraction of Iraq's total munitions inventory was identified and exploited for CW rounds" — that is, checked for chemical weapons. In part, at least, this was because depots were stripped by looters after the Iraqi government was brought down in April 2003. More than a year later, in the Netherlands and Jordan, U.N. inspectors found the first evidence of what had happened: More than 40 missile engines somehow had made their way out of Iraq and into foreign scrap yards, along with four specialized vessels from Iraq's Fallujah chemical plant, which made ingredients for poison gases. But "we have just seen a very thin sliver" of the Iraqi materiel being bought and sold in the Middle East, Perricos said of those finds. In U.N. Security Council discussions, Perricos has suggested his agency return to Iraq to help with arms verification, but the United States hasn't responded. Iraqi representatives say the inspection agency should be shut down. Iraq's chemical-weapons center of the 1980s, a desert complex in the embattled Sunni Triangle, it was overrun by looters who apparently broke into a U.N.-sealed bunker holding old chemical weapons, sarin-filled artillery rockets, the Iraq Survey Group reported. It isn't known whether usable warheads remained in the bunker and what may have been taken. Besides the 377 tons of high-grade explosives, whose disappearance went unreported by the U.S. teams, this huge site south of Baghdad held thousands of pieces of equipment for making explosives, missile propellant and other military products. The U.N. inspectors worry that 800 pieces of specialized chemical equipment, long under U.N. monitoring, have been taken. Satellite images show that many buildings at Iraq's premier nuclear site, south of Baghdad, were systematically dismantled. High-precision equipment long under U.N. monitoring was presumed stolen, including flow-forming machines and electron-beam welders, key to building centrifuges to produce nuclear-bomb fuel. The cost of the fruitless U.S. weapons hunt was both financial and human. The Iraq Survey Group's budget is classified, U.S. officials have said. But Duelfer's predecessor, David Kay, told the AP that a report that $600 million was appropriated for 2004 was correct. That doesn't include a reported $300 million spent on the weapons hunt before the 2004 fiscal year, and additional spending in late 2004. Searching in the midst of war, for evidence that wasn't there, took four lives among the searchers, the CIA reports. Two Iraq Survey Group members died and five were wounded when a building exploded while they searched it, and two more died and one was wounded in an attack on a Duelfer convoy. He escaped injury.